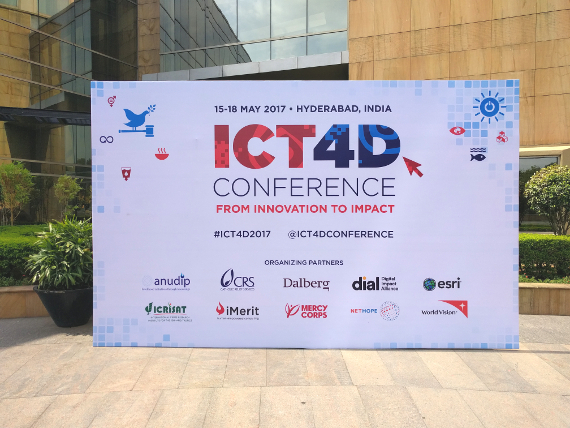 A week ago, I had the pleasure to dive deep into the world of ICT4D at the 9th ICT4D Conference in Hyderabad, India. On short notice I got the confirmation for my ticket while being in Bangalore with one business card, no fancy shirts and an insufficient amount of underwear. 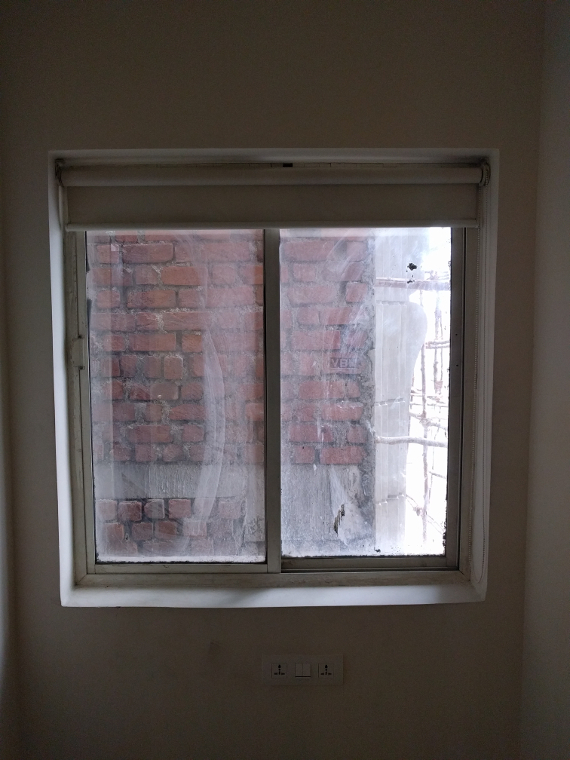 So I booked a flight at the same day, the first hotel which popped up on the net (brick-wall-view as I found out later) and went cloth shopping at the airport. I also managed to shift some work load from my company and worked during coffee breaks on other things. I replaced business cards with a smile and pined my last one on my chest – so people simply took pictures. Busy and exhausting four days, but exiting as well. 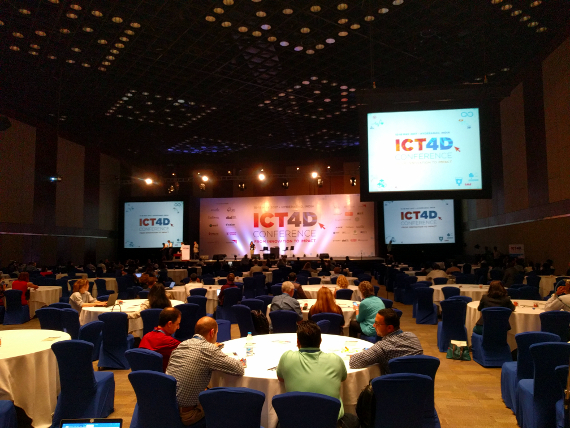 I would like to give here a short overview on what is going on in the world of ICT4D, summarize the talks I enjoyed and state my personal experiences. This year we focus on using data to accelerate achievement of the United Nations’ Sustainable Development Goals. I would like to split this blog post into two sections. 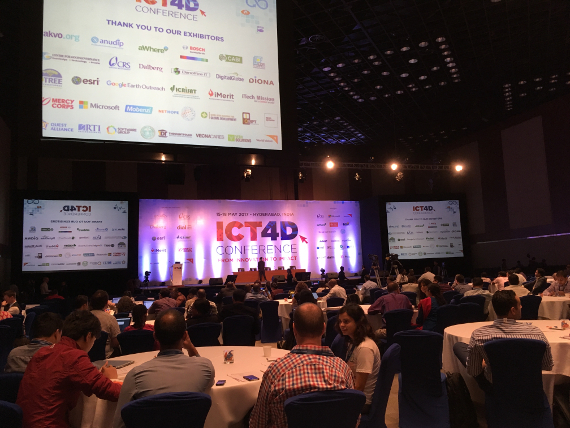 Firstly, I will give you an overview of talks and discussions regarding ICT4D projects I discovered. This will be just a peak of what was going on, most of the time more than 10 talks were happening simultaneously. 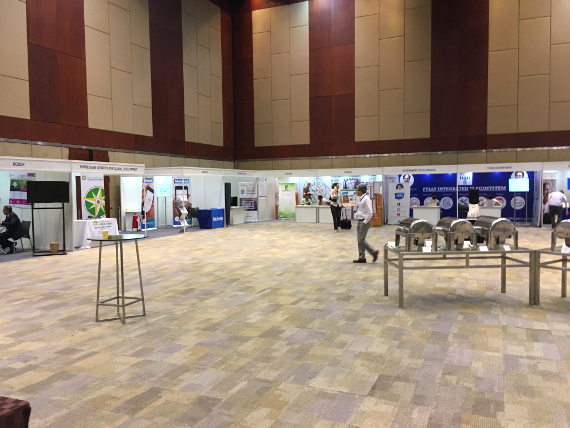 Secondly, I took one full day to visit all sponsors and exhibitors at their stands and discusses with them their products, projects and ideas. is a project with a goal to reduce the risk of dzud (a Mongolian term for a severe winter in which large number of livestock die, primarily due to starvation due to being unable to graze, in other cases directly from the cold) to herder communities and rural economies in Mongolia through on-demand weather information and increased local planning and risk reduction capacity. They implemented a national wide SMS based weather forecast system to provide access for everyone with a mobile phone. The speaker underlined the lack of smartphones in rural areas and the importance of a demand requested system to make it sustainable in the long run. They interviewed users on camera to describe their positive experience to spread the word, which worked best for them. The speaker, Erkhes Batbold from Mercy Corps listed some helpful technologies they used to build the system: engagespark.com, darksky.net , ona.io and lts2sms.com. For me, this talk was one of the most interesting, since it is related to my research as well, and as they started to use a Android phone as a SMS gateway to forward the requests to a server and respond then with the weather forecast. SOS Children’s Village Sri Lanka empowers women at grass-roots through mobile technology using “SMS Quicklearns” to enhance women’s parenting skills on the benefit of their children. The feasibility study showed high mobile penetration at the grass-root level and being mainly fishing communities needed cognizance on various social skills to assure a safe and caring home environment for the children. Text To Change Programme disseminates information on child-care, child rights & protection and managing family income with a view to change their behavior for the well-being of their children & families. e-Monitoring System specifically designed for the use by school monitors to improve the accountability and governance of public primary school system. To strengthen the government school monitoring system of Bangladesh, the Sponsorship program of Bangladesh Save the Children created an Android enabled school monitoring application based on the existing paper based school monitoring checklist and also developed a browser based school inspection data analysis dashboard with various analytical interactive reports. The data is public, the source code is close since it is very specialized. 1. Identify and setup the platform/technology you will use. 3. Implement the e-learning – this is the hardest part. 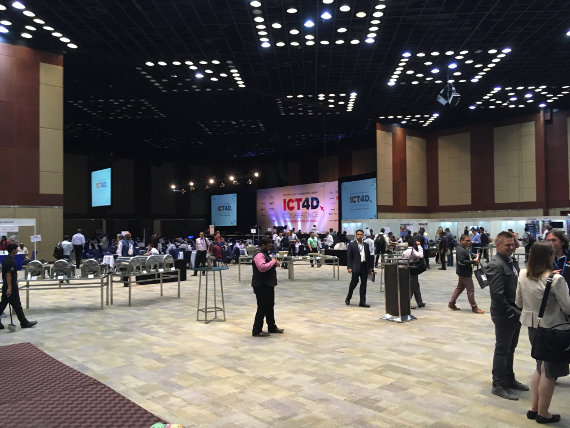 The discussion shifted then to MOOCs which can be helpful but very difficult to implement. Guidance and personal interactions are very important for beginners. The main problem with MOOCs is, that most of the time already educated users use the service and leave out the target group. They underlined that learning is a social process! Furthermore, the panel stated that having test groups straight from the beginning is very important. The fact that it is almost impossible to get proper feedback from failed e-learning users. This is very challenging and they have no solution yet to reach out to these important group to simply find out why they failed. The last conclusion was to show the demand to the users. Create motivation by giving an insight what the learners will get from their education. Jobs and placement are most of the time the goal. Ready to implement a new technology — trade in the paper for smartphones, start administering surveys via SMS, transition to a new CRM system? Worldwide, social impact organizations are seeking technology solutions to better manage data, measure performance, report to donors, & address inefficiencies in programs/operations. When it comes to implementing a new tech tool, how do we gauge whether an organization is “ready”? What happens when the technology implementation – inadvertently or advertently – leads to upheaval in the organization’s processes? 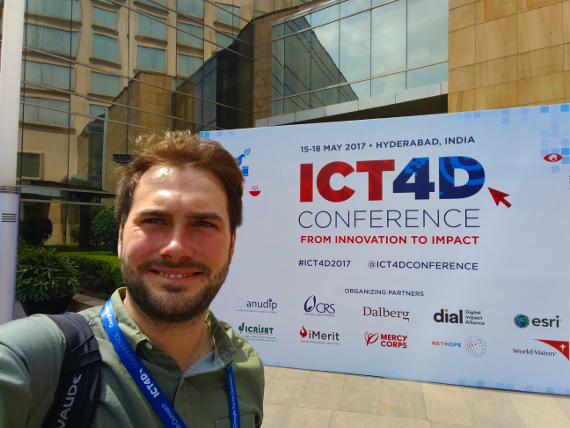 How can we ensure that technology is a tool underpinning quality delivery, with the focus on impact rather than on the tool itself? Vera Solutions discussed with three NGO partners on how they worked together to implement a certain technology to support their work. Pollinate Energy, FMCH – Foundation for Mother & Child Health and Liberty Asia all used IT support to streamline and analyse their processes, collect information on the field and/or get more paperless. All agreed on the profound advantages IT can have. “Why do we need a new Technology” is crucial to ask straight from the beginning to really get the solution which fits best. Start with the people, not the Technology. The Maharashtra government and Microsoft have collaborated to develop a strategic framework for smart village adoption and to identify an impact-driven, public-private partnership-enabled implementation model to transform Harisal into India’s first smart village. Connecting a village to the Internet is one of the key elements to make a village smarter. This can be quite challenging due to the GSM coverage in rural areas and land lines are still rare as well. This project uses TV band white spaces – unused VHF and UHF TV channels that can be used to deliver broadband access over wider areas than possible using today’s Wi-Fi spectrum. They connected villages with this technologies and enabled better access to communication, health and education tools. Waste in the big cities has always been a problem and needs serious handling. Jakarta City every day produces 7000 tons of waste and only about 5200 tons can be transported to the final disposal (TPA) Bantar Gebang by 720 garbage trucks. Of the total trash, 47% is industrial waste and 53% of household waste with a composition of 67% of organic waste; 32.8% inorganic and plastic waste; and 0.2% other debris. In order to support urban waste management, WVI has developed android applications called SESAMA to connect residents with nearby waste bank and help the waste bank managing its administrative works. This application allows residents ordering picking up, tracking their waste amount and checking their money deposit in real time. On the other hand, the waste bank will be able to monitor the waste deposit amount, money deposit, customer’s data and trends of their transaction timely and regularly. Play.Connect.Learn, is a digital app that was developed by Sesame Workshop India (SWI) to determine whether exposure to innovative, interactive digital reading content on smart phones would improve the reading skills of children in Grades 1 and 2 who are reading below grade level. SWI leveraged its library of materials to develop 3 packages of reading materials for the app. The app, developed in Marathi, is being used in 4 districts in Maharashtra by low income families. The app includes packages of stories, rhymes and games that become increasingly more complex in content and skills. They stated that nothing can replace a good pedagogy, but the application is a good tool. Even parents started to learn and like the fact that they use the Sesame Street Puppets in the application. They acknowledged that children lean it many different ways and tried to offer different learning approaches in the application. 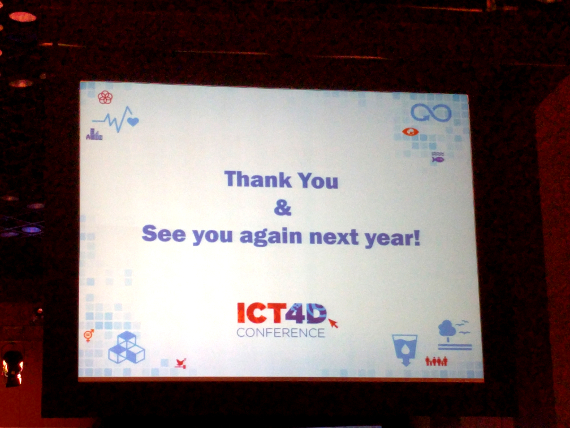 The last talk I joined at the conference was about the wonderful Raspberry Pi. John Anker from the Catholic Relief Services simple introduced the mini computer and showed its possibilities. I use the Raspberry Pi as well in my work to teach computer science and attended the talk out of curiosity. The highligt was the Raspberry Pi operated anti mosquito laser gun – pretty cool stuff. I would also like to underline here that the Raspberry Pi is a very good computer for development work. Cost effective and fully operable – surf the Internet, create textual documents (and more) and program for just $30! Esri’s Nonprofit Organization Program provides conservation and humanitarian nonprofit organizations around the world with an affordable means of acquiring ArcGIS software and services for organized volunteer effort. provides projector sets with speakers to enable mobile video training. 2 hours of battery life are included, but you can charge the gear with a external battery or from your car to and teach anywhere. Quest Alliance – We design learning experiences that inspire and empower educators and learners alike. Mango Logic offers a sophisticated technology to solve complex decision making. Everyone can create a decision tree and a mobile application without programming a single line of code. That’s what D-Tree is doing, they use the technology to provide better Decisions which save lives. D-tree International is harnessing the potential of mobile technology to improve the quality of healthcare provision in the developing world. Most of the software a NGO needs is already out there and they created a collection of apps for a social cause. Social App Hub helps to find IT solutions for NGOs. Anudip’s diverse training, mentorship, and employment support empowers marginalized individuals to change their lives by providing training for illiterate people to find a placement. The work directly with the people and use training centers equipped with computer and Internet connection. Akvo is offering mobile applications to collect data in the field and analyse the outcome. They also have very nice tools of measure water quality with a Android phone. provides networks in the field and ensure their security. The Swiss based company offers a portable server infrastructure to connect and control the data flow. NASSCOM Foundation, by leveraging the capabilities of the IT- BPM sector, is meeting the technology needs of NGOs so that they can: scale up operations, be more efficient, increase reach, deliver effective results; and hence realize the goals they are meant to. transform mobile devices such as phones and tablets into tools for helping your NGO move closer to achieving its mission. Whether it’s greater efficiency, happier clients, more productive caseworkers, or tracking progress of your projects and clients for better outcomes, we work together to help make your mission happen. is a global technology company that is specialized in delivery channel and integration solutions for the financial sector, especially in the micro finance sector. Data Management harnesses agriculture analytics to create unprecedented visibility and insight from farm level to national policy. Their algorithms create 41000 weather stations out of 87 Indian weather stations and support local farmers with their technology.